In response to the growing need for new key skills in the workplace, universities must be ready to offer new courses, teaching formats and strategies. A new discussion paper examines the needs and starting points for teaching skills such as data literacy and collaborative work. 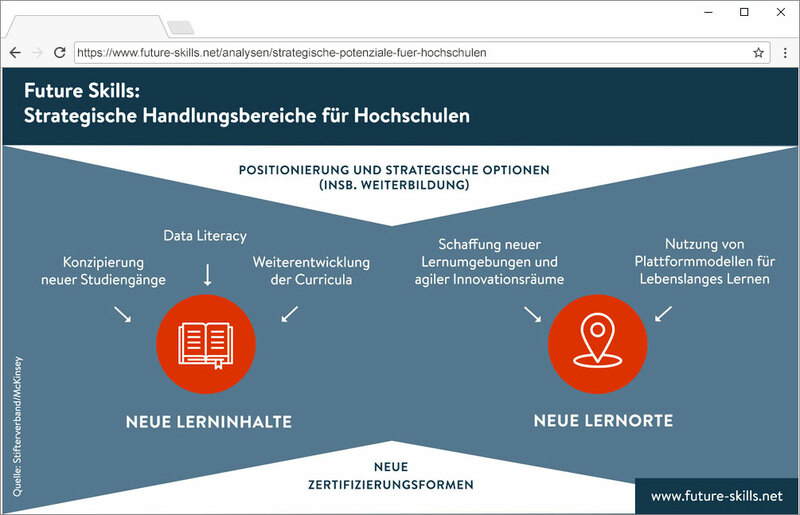 In March 2019, the Stifterverband and McKinsey published the discussion paper “Future Skills: Strategic Potentials for Universities” (link in German). It deals with the need for future-oriented skills such as complex data analysis or collaborative work. It is not just about the education of students, but also about the continuing education of more than 2.4 million currently employed people, who should learn key skills such as agile working, digital learning or collaboration techniques. How this need can be addressed by universities and how strongly universities and companies rely on each other in the qualification of future skills is also discussed in the discussion paper. The discussion paper was written based on a combination of quantitative and qualitative methods. There was a standardised online survey of 607 German companies which followed on from a workshop with 30 participants from start-ups, established companies, educational institutions, politics, administration and associations. This was accompanied by 20 guideline-based expert interviews with human resource managers. The teaching of future skills is seen as a task for higher education institutions, which provides them with opportunities such as teaching innovations and occupying new fields in research and teaching, while at the same time being necessary to adapt to the changing labour market and society. This requires significantly more resources and the further development of degree programs and of teaching and learning formats. Since basic digital skills and traditional skills cannot be taught in lectures and seminars alone, a further development of the formats is required, towards more activating forms such as problem-oriented and project-oriented learning or design thinking. A big, almost paradoxical, challenge for universities here: They are to pioneer the development of new knowledge and the teaching of future skills for the working world of the future – and compete in the labour market with companies for the scarce staff that they need to actually be able to educate the new generation. Because companies can often pay attractive salaries, digital and big data specialists are difficult for universities to find or retain as a workforce. The further qualification of existing university staff and more cooperation with high-tech and data-driven companies could provide a solution for the topics of curriculum development, recruitment and continuing education. Data literacy refers to the ability to deal with data in a planned manner and to be able to consciously use and question the data in the respective context. This includes recording, exploring, managing, curating, analysing, visualizing, interpreting, contextualizing, assessing and applying data. All students and doctoral candidates should possess these basic skills. Many universities are already intensively involved in teaching data literacy skills and are expanding their teaching and continuing education offerings in this direction, for example by creating application-oriented interdisciplinary data labs. New forms of learning and new spaces are needed to teach many future skills. Many universities therefore set up new learning environments, places for collaborative work and innovation spaces where work on concrete project challenges can be carried out together in a flexible and experimental manner, and this can also be together with partners from business and society. These new spaces in turn stimulate the further development of learning concepts. As the need for technological future skills cannot be met by the number of first year students, universities should focus more on the continuing education of professionals. In addition, a variety of continuing education formats, from online seminars to part-time courses should be considered. So far, there is a large untapped potential in the field of continuing education. Linked to this is a change of strategy for universities, which will be required to broaden their teaching courses and formats and to ensure permeability and synergy effects between their own teaching courses and other continuing education opportunities. In order to address very different target groups and to develop more flexible study and educational opportunities, universities will have to deal with the (online-based) scaling of their courses offered. In Germany too, global online platforms such as edX, Coursera (link in German) or Udacity with their predominantly English-language based courses are already used by different target groups, but so far only a few German universities have been offering their own services there and only a few have developed their own platform. At the state level, there are partial platform models, such as the Hamburg Open Online University HOOU (link in German), which do not however have any national or international reach and which only somewhat satisfy the potential demand. For the success of such a platform, which should also focus more on universities as continuing education providers, their integration into a comprehensive system of online and offline courses and the supplementing of courses with digital counselling and support services are of central importance. In contrast to the continuing high importance of formal educational qualifications in Germany, especially in the civil service, international companies and start-ups attach more importance to the proof of relevant competencies in recruitment and the development of career opportunities. This is served by commercial providers with modular continuing education programmes that emphasise the time and content-related focus of their courses and award nanodegrees or microdegrees. In particular, as far as technological skills are concerned, continuing education is increasingly informal, so that new certification modes are needed. (Open) badges as well as experiments that are taking place in Germany with peer-to-peer certifications are interesting in this context.